Robots have all the luck. Researchers have been working overtime to make sure that robots will be able to soft, sensitive skin that feels pain and pressure. Now kindly DARPA boffins are making sure that human beings will also have sensitive artificial skin. 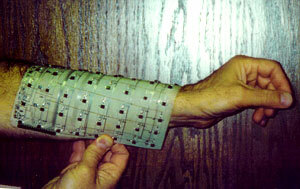 In 2005, Goddard technologist Vladimir Lumelsky worked on sensor embedded skin coverings for robots. This high-tech skin is essential for robots doing space exploration, because humans and robots will work together under different conditions. Robots need to be sensitive. Takao Someya lead a group of University of Tokyo researchers that same year in creating a robotic skin consisting of pressure-sensing and temperature-sensing networks laminated together. 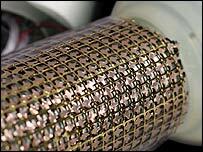 The resulting artificial skin can detect both properties simultaneously. The transistors used in the circuits and the semiconductors both use "organic" materials based on chains of carbon atoms, so maybe robots will "feel" a little bit more human. How will artificial skin conduct sensation for human beings? Vertically aligned carbon nanotubes can make the surface of prosthetic devices feel like the the covering you were born with. 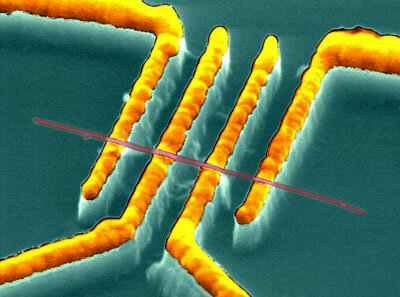 In the example shown above, a nanotube is shown delicately balanced on top of gold filaments, and threaded through a rubbery polymer. The polymer/nanotube skin will transfer heat from the surface to the sensor network below as quickly as your skin communicates this information. The nanotubes enhance the piezoelectric effect inherent in the polymer. The sensors can then generate a signal to the brain. Some robot skin already seems almost good enough to wear; see Robot Skin Soft Like Yours for fembots. Under pressure? Robots have it covered - see Robots Get Pressure-Sensitive Skin - if you don't mind looking like the Tin Man. From Synth Skin for Robo-Limbs; via Nanotubes Make Synthetic Skin Feel Your Pain.